Lexapro (escitalopram) is indicated for the treatment of major depressive disorder. The efficacy of Lexapro in the treatment of major depressive disorder was established in three, 8­ week, placebo-controlled trials of outpatients whose diagnoses corresponded most closely to the DSM-IV category of major depressive disorder (see CLINICAL PHARMACOLOGY). 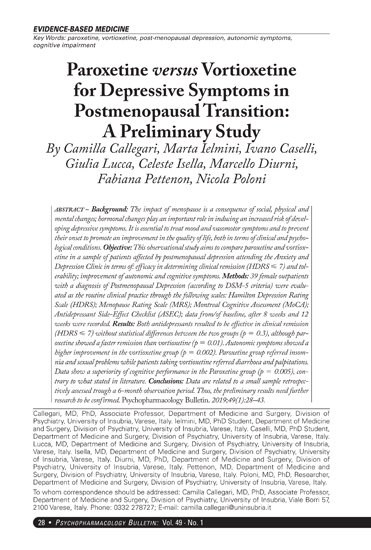 A major depressive episode (DSM-IV) implies a prominent and relatively persistent (nearly every day for at least 2 weeks) depressed or dysphoric mood that usually interferes with daily functioning, and includes at least five of the following nine symptoms: depressed mood, loss of interest in usual activities, significant change in weight and/or appetite, insomnia or hypersomnia, psychomotor agitation or retardation, increased fatigue, feelings of guilt or worthlessness, slowed thinking or impaired concentration, a suicide attempt or suicidal ideation. Lexapro is indicated for the treatment of Generalized Anxiety Disorder (GAD). The efficacy of Lexapro was established in three, 8-week, placebo-controlled trials in patients with GAD (see CLINICAL PHARMACOLOGY). Generalized Anxiety Disorder (DSM-IV) is characterized by excessive anxiety and worry (apprehensive expectation) that is persistent for at least 6 months and which the person finds difficult to control. It must be associated with at least 3 of the following symptoms: restlessness or feeling keyed up or on edge, being easily fatigued, difficulty concentrating or mind going blank, irritability, muscle tension, and sleep disturbance. Major Depressive Disorder – Initial Treatment: The recommended dose of Lexapro is 10 mg once daily. A fixed-dose trial of Lexapro demonstrated the effectiveness of both 10 mg and 20 mg of Lexapro, but failed to demonstrate a greater benefit of 20 mg over 10 mg (see Clinical Efficacy Trials under CLINICAL PHARMACOLOGY). If the dose is increased to 20 mg, this should occur after a minimum of one week. Lexapro should be administered once daily, in the morning or evening, with or without food. Generalized Anxiety Disorder – Initial Treatment: The recommended starting dose of Lexapro is 10 mg once daily. If the dose is increased to 20 mg, this should occur after a minimum of one week. Lexapro should be administered once daily, in the morning or evening, with or without food. Concomitant use in patients taking monoamine oxidase inhibitors (MAOIs) is contraindicated (see WARNINGS). Concomitant use in patients taking pimozide is contraindicated (see Drug Interactions – Pimozide and Celexa). Lexapro is contraindicated in patients with a hypersensitivity to escitalopram or citalopram or any of the inactive ingredients in Lexapro. Clinical Worsening and Suicide Risk: Patients with major depressive disorder (MDD), both adult and pediatric, may experience worsening of their depression and/or the emergence of suicidal ideation and behavior (suicidality) or unusual changes in behavior, whether or not they are taking antidepressant medications, and this risk may persist until significant remission occurs. Suicide is a known risk of depression and certain other psychiatric disorders, and these disorders themselves are the strongest predictors of suicide. There has been a long-standing concern, however, that antidepressants may have a role in inducing worsening of depression and the emergence of suicidality in certain patients during the early phases of treatment. Pooled analyses of shortterm placebo-controlled trials of antidepressant drugs (SSRIs and others) showed that these drugs increase the risk of suicidal thinking and behavior (suicidality) in children, adolescents, and young adults (ages 18-24) with major depressive disorder (MDD) and other psychiatric disorders. Short-term studies did not show an increase in the risk of suicidality with antidepressants compared to placebo in adults beyond age 24; there was a reduction with antidepressants compared to placebo in adults aged 65 and older. Screening Patients for Bipolar Disorder: A major depressive episode may be the initial presentation of bipolar disorder. 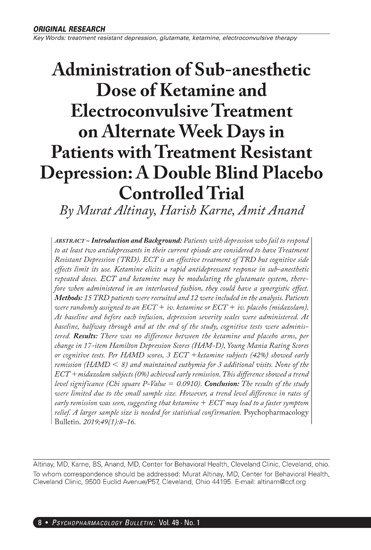 It is generally believed (though not established in controlled trials) that treating such an episode with an antidepressant alone may increase the likelihood of precipitation of a mixed/manic episode in patients at risk or bipolar disorder. Whether any of the symptoms described above represent such a conversion is unknown. However, prior to initiating treatment with an antidepressant, patients with depressive symptoms should be adequately screened to determine if they are at risk for bipolar disorder; such screening should include a detailed psychiatric history, including a family history of suicide, bipolar disorder, and depression. It should be noted that Lexapro is not approved for use in treating bipolar depression. Serotonin Syndrome or Neuroleptic Malignant Syndrome (NMS)-like Reactions: The development of a potentially life-threatening serotonin syndrome or Neuroleptic Malignant Syndrome (NMS)-like reactions have been reported with SNRIs and SSRIs alone, including Lexapro treatment, but particularly with concomitant use of serotonergic drugs (including triptans) with drugs which impair metabolism of serotonin (including MAOIs), or with antipsychotics or other dopamine antagonists. Serotonin syndrome symptoms may include mental status changes (e.g., agitation, hallucinations, coma), autonomic instability (e.g., tachycardia, labile blood pressure, hyperthermia), neuromuscular aberrations (e.g., hyperreflexia, incoordination) and/or gastrointestinal symptoms (e.g., nausea, vomiting, diarrhea). Serotonin syndrome, in its most severe form can resemble neuroleptic malignant syndrome, which includes hyperthermia, muscle rigidity, autonomic instability with possible rapid fluctuation of vital signs, and mental status changes. Patients should be monitored for the emergence of serotonin syndrome or NMS-like signs and symptoms. 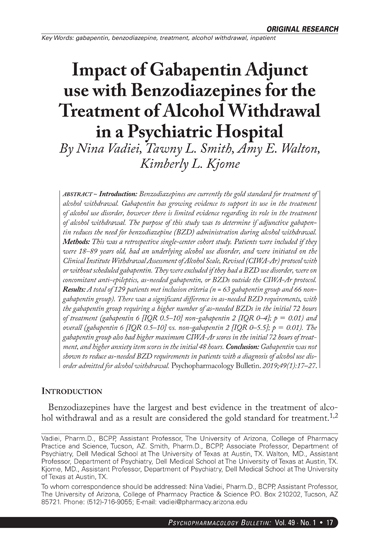 Discontinuation of Treatment with Lexapro: During marketing of Lexapro and other SSRIs and SNRIs (serotonin and norepinephrine reuptake inhibitors), there have been spontaneous reports of adverse events occurring upon discontinuation of these drugs, particularly when abrupt, including the following: dysphoric mood, irritability, agitation, dizziness, sensory disturbances (e.g., paresthesias such as electric shock sensations), anxiety, confusion, headache, lethargy, emotional lability, insomnia, and hypomania. While these events are generally self-limiting, there have been reports of serious discontinuation symptoms. Abnormal Bleeding: SSRIs and SNRIs, including Lexapro, may increase the risk of bleeding events. Concomitant use of aspirin, nonsteroidal anti-inflammatory drugs, warfarin, and other anticoagulants may add to the risk. Case reports and epidemiological studies (case-control and cohort design) have demonstrated an association between use of drugs that interfere with serotonin reuptake and the occurrence of gastrointestinal bleeding. Bleeding events related to SSRIs and SNRIs use have ranged from ecchymoses, hematomas, epistaxis, and petechiae to life-threatening hemorrhages. Hyponatremia: Hyponatremia may occur as a result of treatment with SSRIs and SNRIs, including Lexapro. In many cases, this hyponatremia appears to be the result of the syndrome of inappropriate antidiuretic hormone secretion (SIADH), and was reversible when Lexapro was discontinued. Cases with serum sodium lower than 110 mmol/L have been reported. Elderly patients may be at greater risk of developing hyponatremia with SSRIs and SNRIs. Also, patients taking diuretics or who are otherwise volume depleted may be at greater risk (see Geriatric Use). Discontinuation of Lexapro should be considered in patients with symptomatic hyponatremia and appropriate medical intervention should be instituted. Signs and symptoms of hyponatremia include headache, difficulty concentrating, memory impairment, confusion, weakness, and unsteadiness, which may lead to falls. Signs and symptoms associated with more severe and/or acute cases have included hallucination, syncope, seizure, coma, respiratory arrest, and death. Activation of Mania/Hypomania: In placebo-controlled trials of Lexapro in major depressive disorder, activation of mania/hypomania was reported in one (0.1%) of 715 patients treated with Lexapro and in none of the 592 patients treated with placebo. One additional case of hypomania has been reported in association with Lexapro treatment. Activation of mania/hypomania has also been reported in a small proportion of patients with major affective disorders treated with racemic citalopram and other marketed drugs effective in the treatment of major depressive disorder. As with all drugs effective in the treatment of major depressive disorder, Lexapro should be used cautiously in patients with a history of mania. 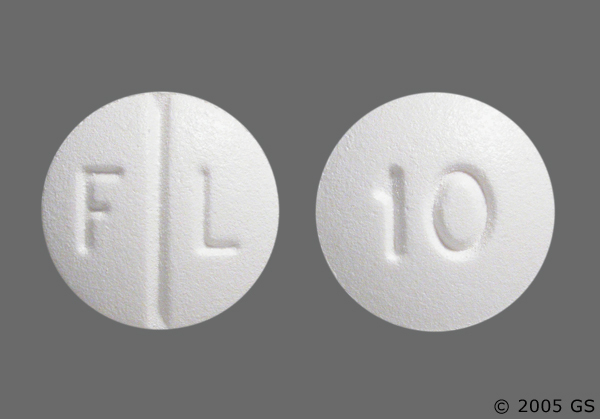 Seizures: Although anticonvulsant effects of racemic citalopram have been observed in animal studies, Lexapro has not been systematically evaluated in patients with a seizure disorder. These patients were excluded from clinical studies during the product’s premarketing testing. In clinical trials of Lexapro, cases of convulsion have been reported in association with Lexapro treatment. Like other drugs effective in the treatment of major depressive disorder, Lexapro should be introduced with care in patients with a history of seizure disorder. Interference with Cognitive and Motor Performance: In a study in normal volunteers, Lexapro 10 mg/day did not produce impairment of intellectual function or psychomotor performance. Because any psychoactive drug may impair judgment, thinking, or motor skills, however, patients should be cautioned about operating hazardous machinery, including automobiles, until they are reasonably certain that Lexapro therapy does not affect their ability to engage in such activities. Use in Patients with Concomitant Illness: Clinical experience with Lexapro in patients with certain concomitant systemic illnesses is limited. Caution is advisable in using Lexapro in patients with diseases or conditions that produce altered metabolism or hemodynamic responses. Vital Sign Changes: Lexapro and placebo groups were compared with respect to (1) mean change from baseline in vital signs (pulse, systolic blood pressure, and diastolic blood pressure) and (2) the incidence of patients meeting criteria for potentially clinically significant changes from baseline in these variables. These analyses did not reveal any clinically important changes in vital signs associated with Lexapro treatment. In addition, a comparison of supine and standing vital sign measures in subjects receiving Lexapro indicated that Lexapro treatment is not associated with orthostatic changes. Weight Changes: Patients treated with Lexapro in controlled trials did not differ from placebo-treated patients with regard to clinically important change in body weight. Laboratory Changes: Lexapro and placebo groups were compared with respect to (1) mean change from baseline in various serum chemistry, hematology, and urinalysis variables, and (2) the incidence of patients meeting criteria for potentially clinically significant changes from baseline in these variables. These analyses revealed no clinically important changes in laboratory test parameters associated with Lexapro treatment. 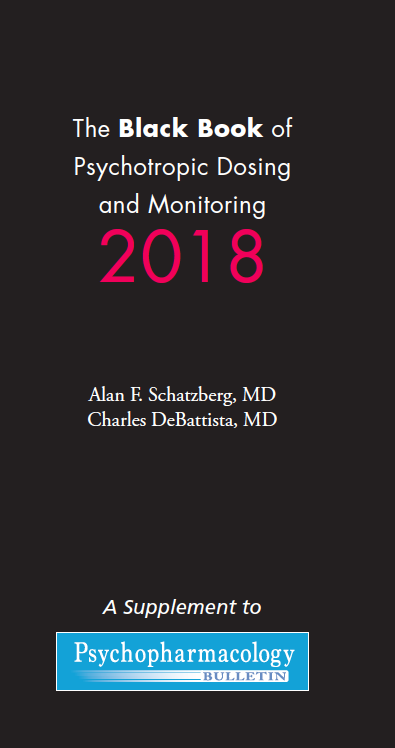 ECG Changes: Electrocardiograms from Lexapro (N=625), racemic citalopram (N=351), and placebo (N=527) groups were compared with respect to (1) mean change from baseline in various ECG parameters and (2) the incidence of patients meeting criteria for potentially clinically significant changes from baseline in these variables. These analyses revealed (1) a decrease in heart rate of 2.2 bpm for Lexapro and 2.7 bpm for racemic citalopram, compared to an increase of 0.3 bpm for placebo and (2) an increase in QTc interval of 3.9 msec for Lexapro and 3.7 msec for racemic citalopram, compared to 0.5 msec for placebo. Neither Lexapro nor racemic citalopram were associated with the development of clinically significant ECG abnormalities. Infrequent: tremor, vertigo, restless legs, shaking, twitching, dysequilibrium, tics, carpal tunnel syndrome, muscle contractions involuntary, sluggishness, coordination abnormal, faintness, hyperreflexia, muscular tone increased. Gastrointestinal Disorders – Frequent: heartburn, abdominal cramp, gastroenteritis. Infrequent: gastroesophageal reflux, bloating, abdominal discomfort, dyspepsia, increased stool frequency, belching, gastritis, hemorrhoids, gagging, polyposis gastric, swallowing difficult. General – Frequent: allergy, pain in limb, fever, hot flushes, chest pain. Infrequent: edema of extremities, chills, tightness of chest, leg pain, asthenia, syncope, malaise, anaphylaxis, fall. Hemic and Lymphatic Disorders – Infrequent: bruise, anemia, nosebleed, hematoma, lymphadenopathy cervical. Metabolic and Nutritional Disorders – Frequent: increased weight. Infrequent: decreased weight, hyperglycemia, thirst, bilirubin increased, hepatic enzymes increased, gout, hypercholesterolemia. Musculoskeletal System Disorders – Frequent: arthralgia, myalgia. Infrequent: jaw stiffness, muscle cramp, muscle stiffness, arthritis, muscle weakness, back discomfort, arthropathy, jaw pain, joint stiffness. Psychiatric Disorders – Frequent: appetite increased, lethargy, irritability, concentration impaired. Infrequent: jitteriness, panic reaction, agitation, apathy, forgetfulness, depression aggravated, nervousness, restlessness aggravated, suicide attempt, amnesia, anxiety attack, bruxism, carbohydrate craving, confusion, depersonalization, disorientation, emotional lability, feeling unreal, tremulousness nervous, crying abnormal, depression, excitability, auditory hallucination, suicidal tendency. Respiratory System Disorders – Frequent: bronchitis, sinus congestion, coughing, nasal congestion, sinus headache. Infrequent: asthma, breath shortness, laryngitis, pneumonia, tracheitis. Skin and Appendages Disorders – Frequent: rash. Infrequent: pruritus, acne, alopecia, eczema, dermatitis, dry skin, folliculitis, lipoma, furunculosis, dry lips, skin nodule. Special Senses – Frequent: vision blurred, tinnitus. Infrequent: taste alteration, earache, conjunctivitis, vision abnormal, dry eyes, eye irritation, visual disturbance, eye infection, pupils dilated, metallic taste.